As Indonesia faces yet another volcanic eruption, the BBC looks at some of the most recent volcanic blasts and at why Indonesia's islands are so volatile. Volcanic ash spewing from Lombok's Mount Rinjani has locked down airports on the holiday island of Bali. 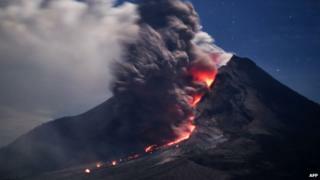 Earlier this year, East Java's Mount Raung did the same, stranding thousands of passengers. That came months after Mt Kelud's eruption blanketed towns in ash and gravel, and led to 100,000 people fleeing their homes. Another active volcano is Mt Sinabung on the Indonesian island of Sumatra, which burst into life in 2010, after 400 years of dormancy. On 1 February 2014, a series of eruptions spewed hot gas, ash and rocks 2km (1.5 miles) into the air, killing at least 14 people. One of the most deadly volcanic eruptions in recent years was from Mt Merapi, which began a series of eruptions in late 2010. Its biggest eruption was on 5 November 2010, when it shot out jets of boiling gas and rock. It killed more than 350 people before its alert level was downgraded. East Java is home to the Ijen volcano, which last erupted in 1999 with ash, but not magma. The volcano is characterised by a turquoise-coloured crater lake which measures 1km across, with water having a pH of 0.5 similar to battery acid. Indonesia frequently experiences earthquakes and volcanic eruptions because it lies near an intersection of shifting tectonic plates, including the Pacific plate, Eurasian plate, Australian plate and Philippine plate. The United States Geological Survey describes the Indonesian region as one of the most seismically active zones on earth. Powerful earthquakes in March 2005 and May 2006 killed thousands of people in Indonesia. In December 2004, more than 220,000 people in Indonesia were killed or classified as missing after a powerful undersea earthquake off Sumatra generated a powerful tsunami. The Indian Ocean tsunami devastated communities as far afield as Thailand, India, Sri Lanka and Somalia. The disaster prompted Indonesia to develop a new tsunami early warning centre, designed to give people in coastal areas enough time to escape waves before they reach land. But one of the most well-known volcanic eruptions in Indonesia happened in August 1883 on an island located west of Java. The volcanic island of Krakatoa erupted without warning, and within a day, virtually disappeared in the loudest explosion ever recorded. Archival records say the sound was heard from miles away. Massive tsunamis following the eruption also hammered the coastlines of Java and Sumatra, leaving over 30,000 people dead. Thousands more were killed by hot ash.